A little to the north of Loei city (pronounced Loy), is a bat cave at Phu Pha Ya bat cave, where some 6 million Thailand Roundleaf Bat roost during the day, venturing out just before dusk for their evening feeding period. The park is not very easy to find without spoken Thai or the ability to read Thai, as it is not considered to be one of the main attractions. The park is actually rather small, and it is only to see the bats that draws people here. On entering the site, there is a narrow track leading to the left, which takes you to the car park, which for some reason appears to have an unusually high number of toilet facilities available (for free). Once parked, if you face the limestone hill, you should be able to see the cave entrance above. You can stay in the car park and see the bats reasonably well, or take a walk up the steps which go to the cave entrance. Be warned though, in the heat and humidity, climbing the steps can be quite exhausting if you are not used to regular exercise, but if you arrive early enough you can give yourself plenty of time to reach the top. The cave entrance is not that high, perhaps 45m at the most, but one thing that is very noticeable is the smell that emanates from the cave. As you climb the steps you are likely to get your first sniff of ammonia, and as you get closer to the cave entrance, so the stronger it gets. It is possible to go in to the cave, but only a short way, but you need to breath in and hold your breath to do so. I was not too confident about doing that so only got perhaps 5m from the entrance. Inside the cave entrance is a small Buddhist shrine, which marks the furthest point you can access, or would ever want to without a full breathing apparatus available. I know this as a friend I was with did go inside, as he was far braver than I wanted to be. We arrived at the Phu Pha Ya bat cave at about 5.45pm, hoping the wait would not be too long and I timed the exit from the cave at roughly 6.30pm, and the light was now fading quickly. The problem with the lack of light, other than getting good photographs, is getting back down the steps to the car park, so we stayed as long as we dared at the top, before heading back down. We got about 15 minutes of prime viewing time, although pictures taken with a 'flash' did not produce results any better than those without. The image to the left was unfortunately as good as it got, as the speed of the bats was just too fast to catch them properly, but you get the idea. We were told that the bats normally leave the cave just a little after 6.00 pm, so this was a late shift for them, and consequently our photography was not as good as it would have been some 25 minutes earlier. 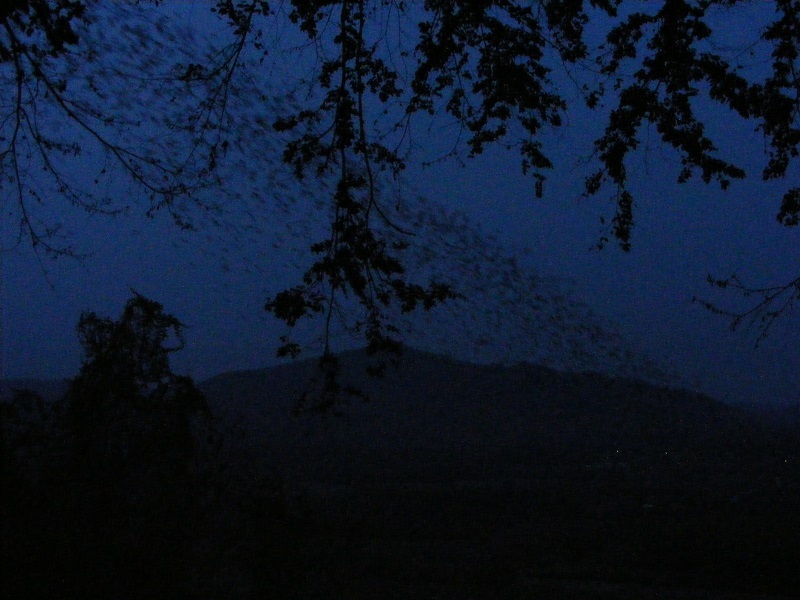 The entire bat colony takes about 2 hours to leave the cave, although from about 7.00 pm, you can see nothing in the sky above from the car park, but you will still hear the wings beating as they pass overhead. 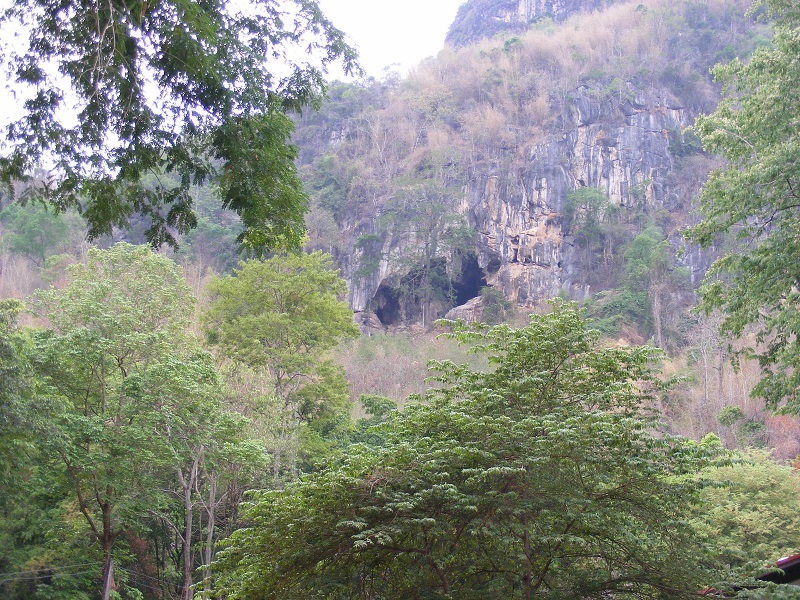 Phu Pha Ya bat cave is about 135km from Udon Thani and takes a little over two hours by car. The roads near Leoi are not especially good, with pot holes in many places which will slow you down a little, so you may want to leave a little early to be sure to see the show. 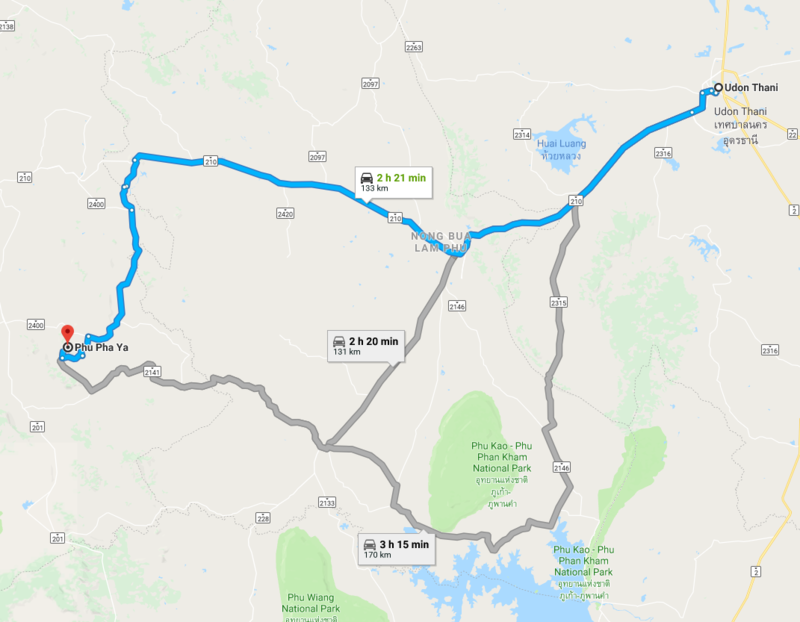 From the Udon Thani ring road, head west on road 210 to Nong Bua Lam Phu, then to Na Wang, where you can turn of and use the rural roads, which is the shortest route. ​Using GPS co-orinates is by far the easiest method of navigating to Phu Pha Ya bat cave. GPS co-ordinates are 17.5771155, 101.8948775. Once you exit the main road and on to the rural roads, be prepared to negotiate a seemingly endless number of potholes in the road, and this should perhaps deter you from trying to drive back on the same roads when returning.